Projects Abroad is starting a new Marine Mammal Conservation volunteer project in Mozambique. The dugong has been hunted for thousands of years for the use of its meat and for oil. The dugong as a species is vulnerable to extinction and is now referred to as one of the rarest mammals on earth. Although the hunting of dugongs is strictly prohibited, the destruction of their feeding habitat and fishing related fatalities see their numbers continue to decline. The dugong has a lifespan of over 70 years and with a slow rate of reproduction, it is especially vulnerable to a loss in numbers. 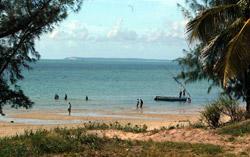 Projects Abroad’s new project is based in the town of Vilanculos on the south-eastern coast of Mozambique. This coastline is one of the last remaining breeding grounds of the dugong. Volunteers work with the community to address problems of over-fishing and prevent dredging of the sea bed which destroys the sea grasses in shallow water which the dugongs feed on. Volunteers snorkel to collect sea grass for re-plantation in designated protected breeding sites as well as recording dugong numbers on overnight boat trips and mapping locations with GPS on fact finding projects. Volunteers also working on projects to address the problem of over-fishing by creating artificial breeding sites as well as taking part in turtle, dolphin, whale shark and manta ray surveys.